Really, we’re all kids at heart. It’s nice to get toys, real honest to goodness toys once in while. That’s what Christmas should be about. And there are plenty of toys that are for adults, and like usual, I’ve found the best of them. And of course, the best toys have to do with Monty Python’s Holy Grail movie. 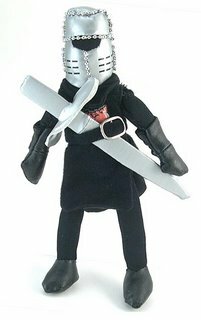 Who wouldn’t want to have the Black Knight on their desk to remind them that you can’t lose if you don’t give up? In the workplace, there are many adversaries and obstacles between you and success. They take the form of many things, such as reams of paperwork, volumes of webpages, hoards of underlings, or lines of stubborn computer code. And then, right when you are about to succeed, one more annoyance (normally that dreaded monster called “Boss”) shows up, breathing noxious stuff like corrections and deadlines. But fear not, dear friend, for we offer a solution proven by history to work: the King Arthur Approach to Problem Solving. You see, King Arthur had a similar problem, as documented in the historical/factual epic Monty Python and the Holy Grail. You will recall, in his journeys, King Arthur came to a bridge which was guarded by a Black Knight. King Arthur, in all his wisdom, first tried to make friends with the Knight. Turning a problem into an advantage (or an enemy into a friend) is step one in the King Arthur Approach. And, when befriending the Black Knight didn’t work, noble King Arthur hacked the rogue to bits. That’s what we call step two: breaking a problem into manageable parts. 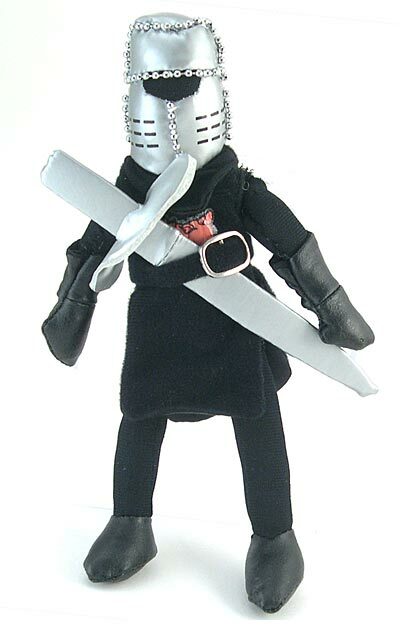 We offer you this plush Black Knight as a reminder of the King Arthur Approach. And, if you get seriously mad or stressed, you can tear its limbs off. However, please do not attempt tearing anything off your coworkers. Straight from the movie Monty Python and the Holy Grail comes this furry harbinger of doom. Cute, furry, soft, and completely deadly. Look at those teeth – they weren’t made for vegetables. No, this rabbit has an appetite for only one thing: human flesh! 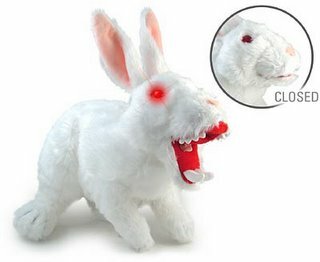 This is a plush life-sized version of that famed beast of destruction. It looks like a cute little bunny, but pull open its mouth to reveal its hideously deformed teeth. And if that’s not enough, squeeze its leg (if you dare!) to start its evil red eyes flashing. Unless you happen to have a Holy Hand Grenade in your arsenal, there is only one thing left for you to do: Run Away! Run Away! It amazes me that at my age I still watch cartoons. The best part is the fact that the cartoons tend to be leagues ahead of the boring and formulaic sitcoms on television. Years after Married with Children stopped being funny, I can still stick a Beavis and Butthead or Simpson’s DVD into the television and leave reality for a few precious moments. 8.5″ tall wind up die cast interactive Bender, from Futurama (fully licensed). Twist the antenna on top of his head and his expression will change from ‘normal’ bender to ‘angry’ bender. Perfect to fend off unwanted visitors. 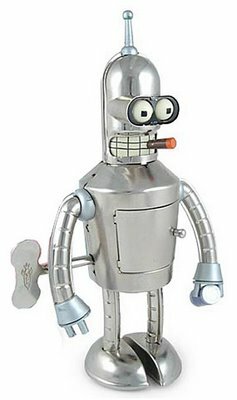 Optionally insert an included cigar into his mouth for those times when Bender just needs to mellow down. Two versions to choose from: 1) Gender Bender, includes a removeable wig, tutu, wand, cigar and can of robot oil! or 2) Bare Metal Bender, includes a can of Mom’s Old Fashioned Robot Oil. Arms articulate! Wind up key to make Bender walk inserts into side and is removable (his arms will also swing while in motion!). Open up Bender’s ribcage compartment and see what’s going on inside! Or just wind him up and let him walk all over your TPS reports. He doesn’t care. He’s bender, you new best desktop friend with an attitude. That Bender toy is really a work of art, in my humble opinion. I happily announce that I will be attending that MOB event taking place at Keegan’s Irish Pub on Saturday, December 17. The party starts at 5pm. I encourage all of my crackpot (and most of my normal) readers to also attend. If you need directions I’m more than happy to help. Is there a case to be made for going? Not sure, I’ve gone to three MOB events. The first one I went to I pretty much stayed in a corner. The second one I went to I met Kevin Ecker and was scarred for life. The third one I went to I just sat in amusement and fear of Learned Foot, that was a good time. So, make preparations to go already.